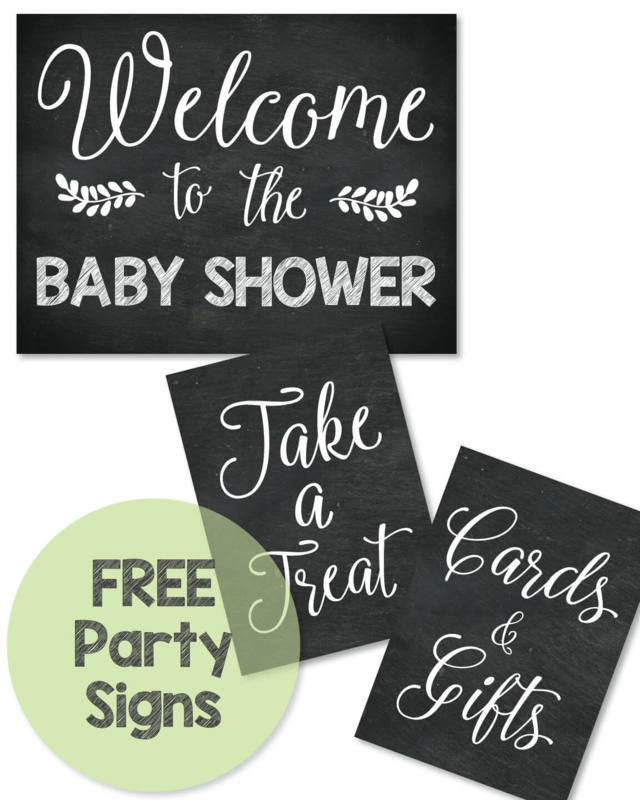 Hosting a "Polka Dot Baby Shower" is a trendy way to celebrate a new baby! The ideas and possibilities are endless - and you can make things as creative or as simple as you want! 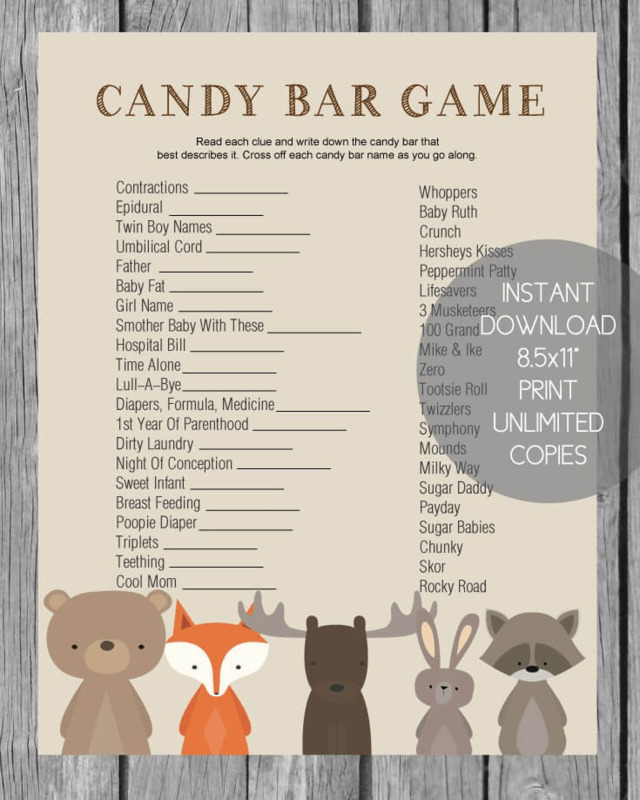 So if you are looking for a cute baby shower theme, this is it! It is perfect for a boy or a girl baby shower! 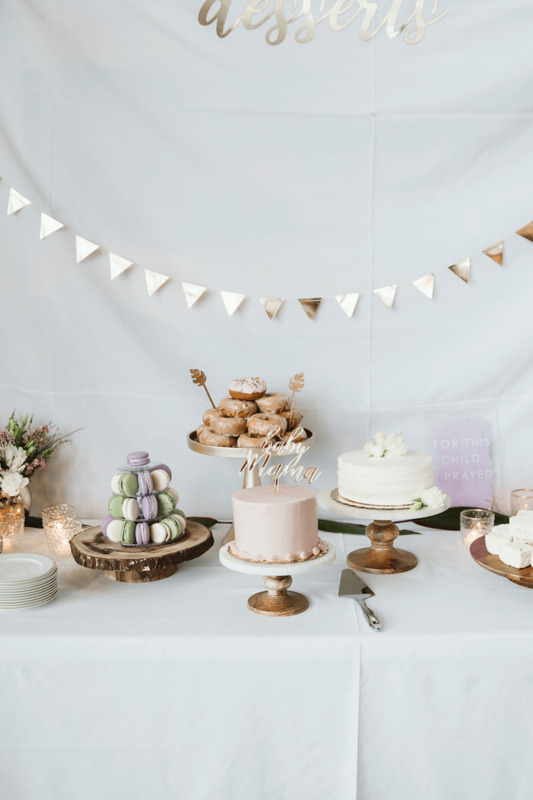 Below are some polka dot baby shower ideas and cake pictures to inspire you! Make a polka dot cake! 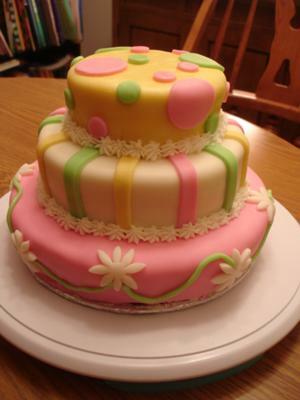 Bake a 2 layer round cake, frost any color you'd like and decorate with polka dots (using fondant or piping on frosting.) You can also do the same with cupcakes! Hot glue peanut M&M's all around a Styrofoam topiary or wreath shape - looks so cute! Make some circle-shaped sugar cookies (use the rim of a glass to cut the dough) frost and pipe on some pretty polka dots! Serve food on polka dot plates! 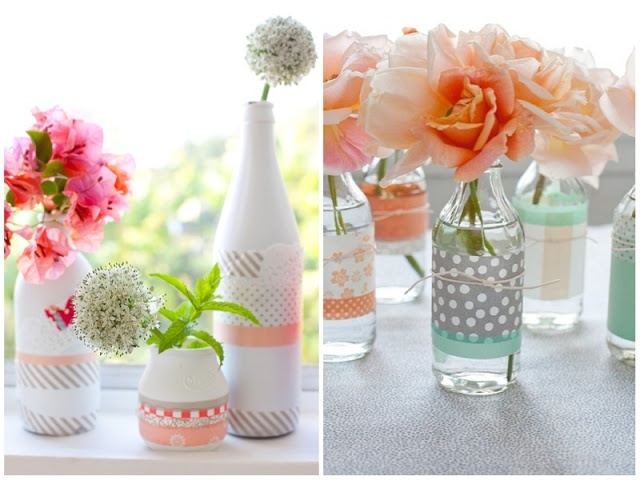 Sprinkle cute polka dot confetti all over counters and tabletops! We visited our favorite baby shower shop and hand picked our favorite polka dot themed items for you! 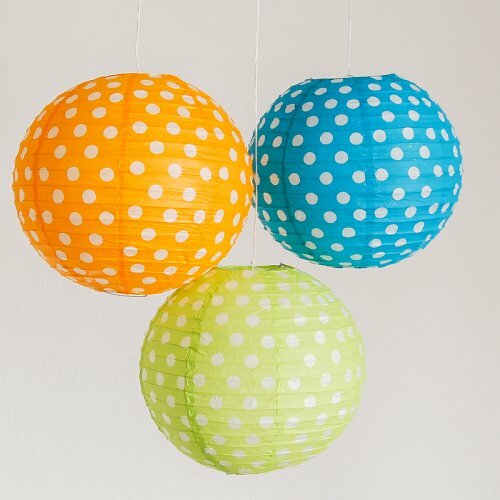 The cute polka dot lanterns add a pop of color and excited to the room! 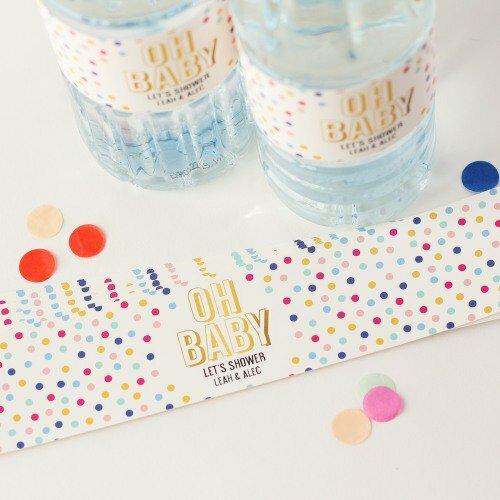 And wrap these handy baby shower water bottle labels around bottled water for instant cuteness! 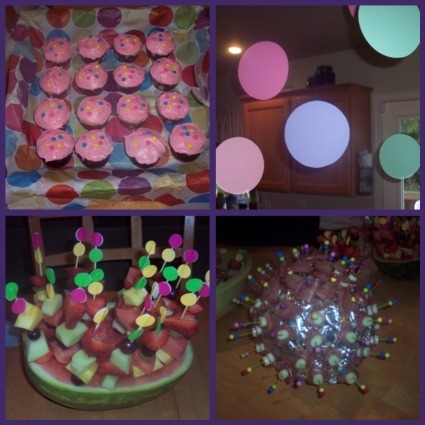 We also found cute polka dot balloons, popular polka dot cupcake wrappers, plates, cups, favors and more! If you have not yet experienced Washi tape, you're in for a real treat! It is a thin tape (kind of like masking tape) that has cute patterns on it. 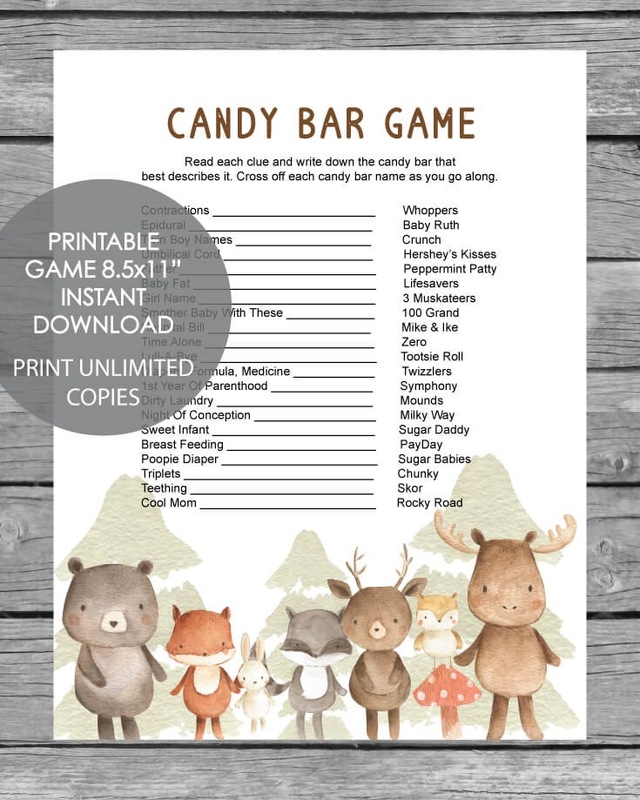 You can use it to decorate packages, wrap it around toothpicks to make cute paper flags, wrap around candles, vases, cups, glasses and anything else you can think of! is to visit your local craft store and pick up some cute and colorful, polka dot-themed scrapbook paper. 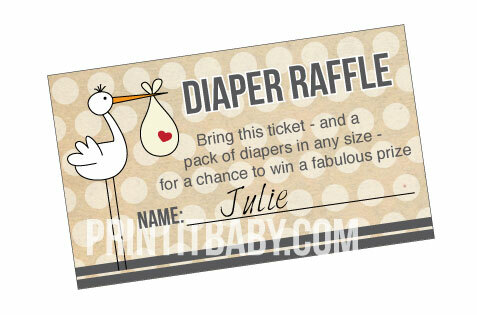 Printable polka dot stork diaper raffle tickets. 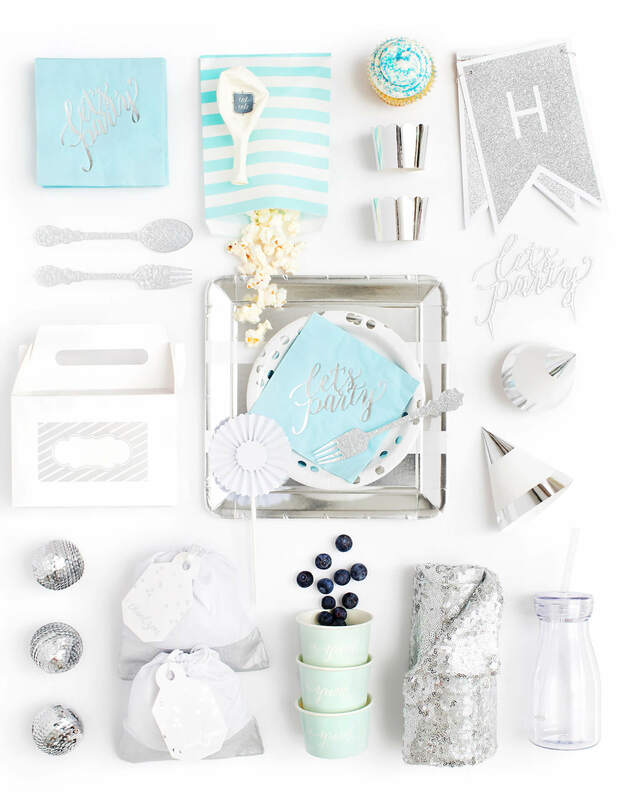 Tuck in to the baby shower invitations before sending them out. 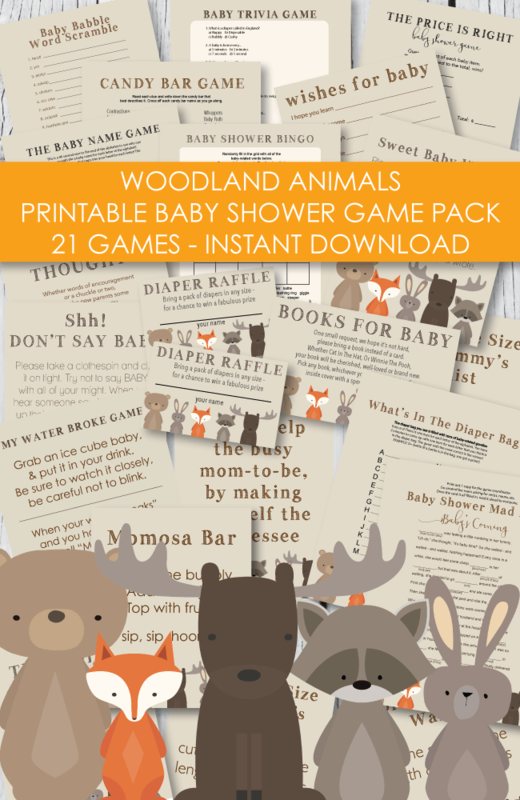 This lets guests know that they can bring a pack of diapers if they want to participate in a diaper raffle. 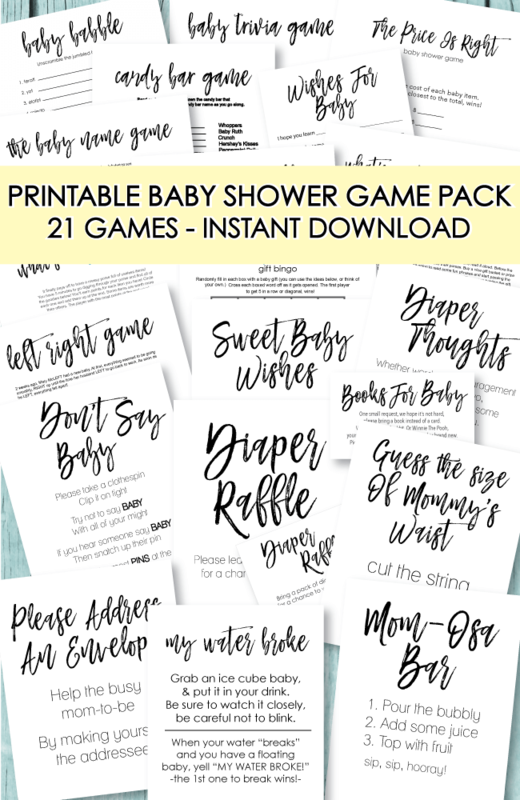 Everyone that brings a pack of diaper gets entered into the raffle and a winner is drawn at the end of the baby shower. 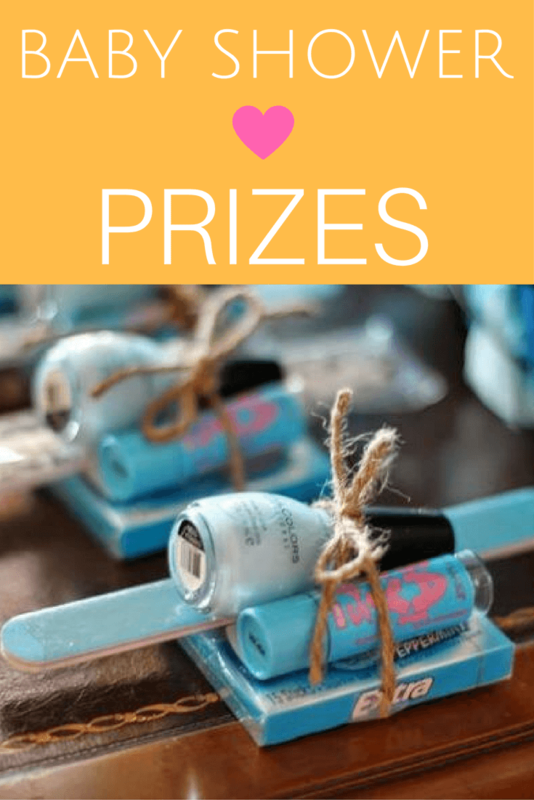 The winner gets a prize! 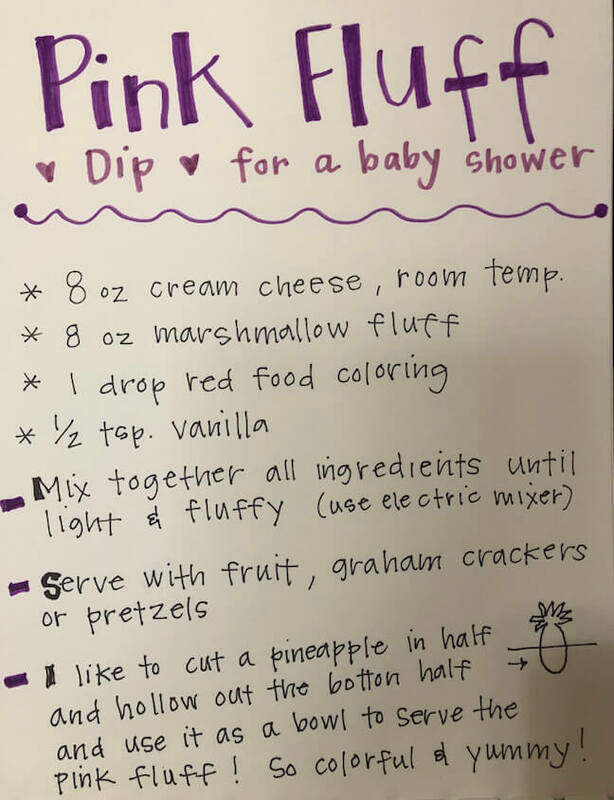 This is a wonderful way for the expecting mom to stock up on her diaper supply! 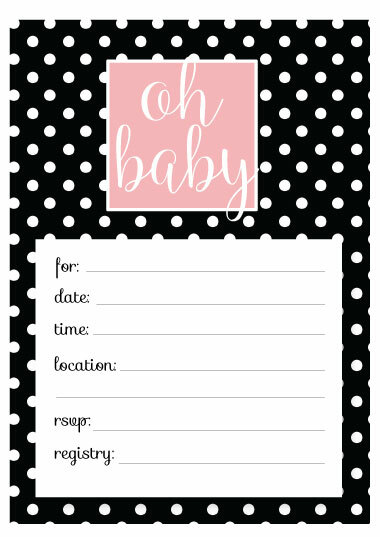 Polka dot baby shower invitations that you can print from home! 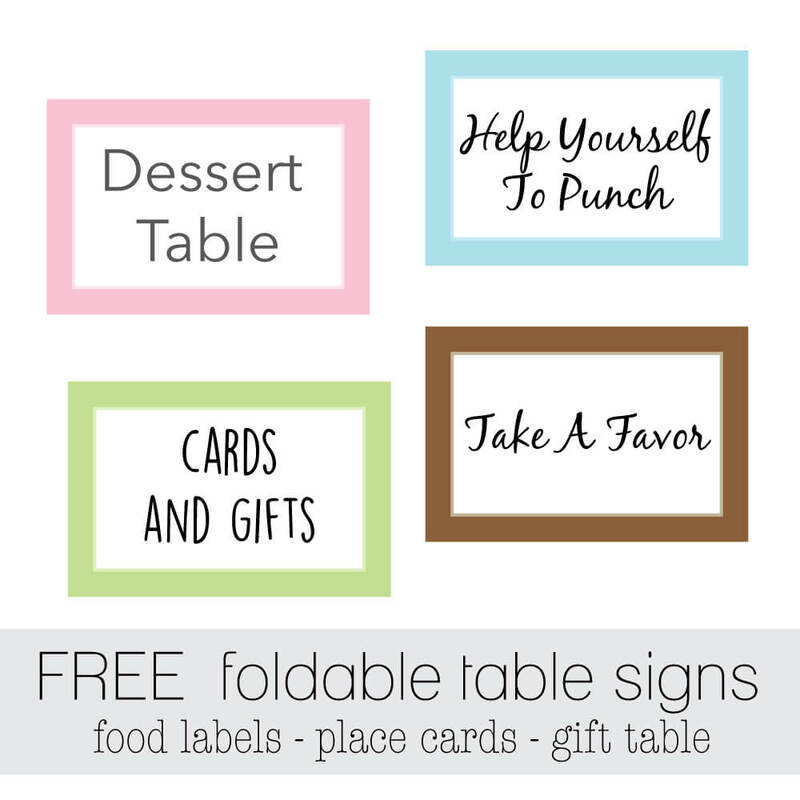 We whipped up some printable invitations for easy planning - access them here. 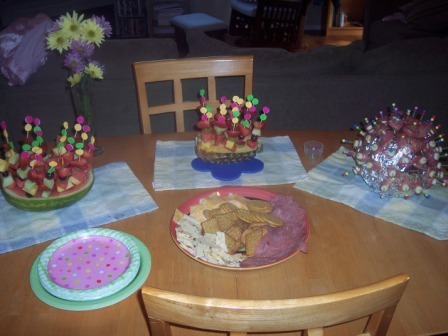 For the fruit platter, cut a watermelon in half. 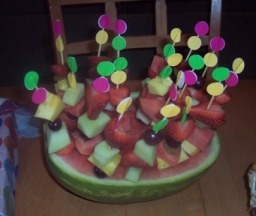 Cut up assorted fruits and put them onto skewers. On the top of the skewers, use colored, round stickers (garage sale labels) and place them back-to-back on the skewers. Using a large Styrofoam ball (found at craft stores), cover with foil. Find some large plastic toothpicks with balls on top and skewer salami and cheese onto them (string cheese works great). Poke into foil ball. This 3-tiered cake is composed of 4, 6 and 8 inch single layers of my secret white cake. Each tier was iced with butter cream and covered in tinted yellow, white and pink marshmallow fondant. The dots, stripes and daisies are fondant cut outs, and the layers are trimmed with butter cream stars. This cake was made for my sister's baby shower. I used 3 9"x13" cakes(2 in the bottom layer, 1 cut in half and stacked for the top layer). I layered the cakes with store bought icing between layers, then iced the outsides and refrigerated. 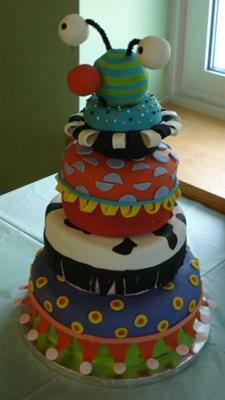 Both cakes were then covered in white fondant, and pastel polka dots were added. Small balls of rolled fondant covered the seams of the cakes. As an added touch, I added a few baby items around. To mimic a present, I added a gift tag to the top! I used a butter recipe for both tiers of this cake. I iced the entire cake with buttercream icing, tinted lightly with Wilton royal blue color. 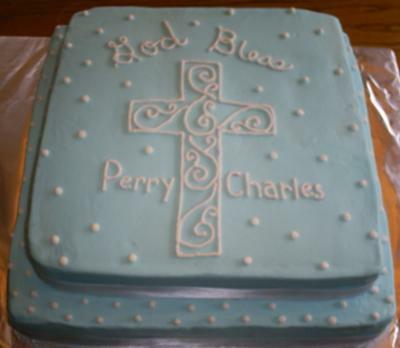 I piped writing, polka dots and decorated cross with white buttercream icing. The border is basic white satin ribbon attached with small dots of icing. I used a butter recipe for my base tier and a chocolate cake recipe for the top tier. I iced both cakes with butter cream icing in white. 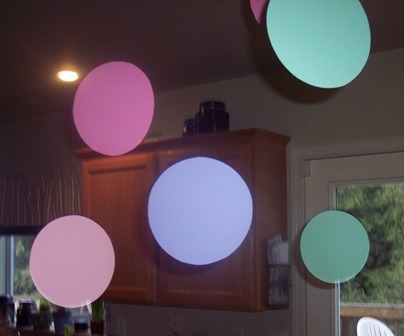 I used yellow and blue color to make the light shades for writing and polka dots. Instead of a border of icing, I used gingham ribbon (from a craft store) attached with a few dots of icing. 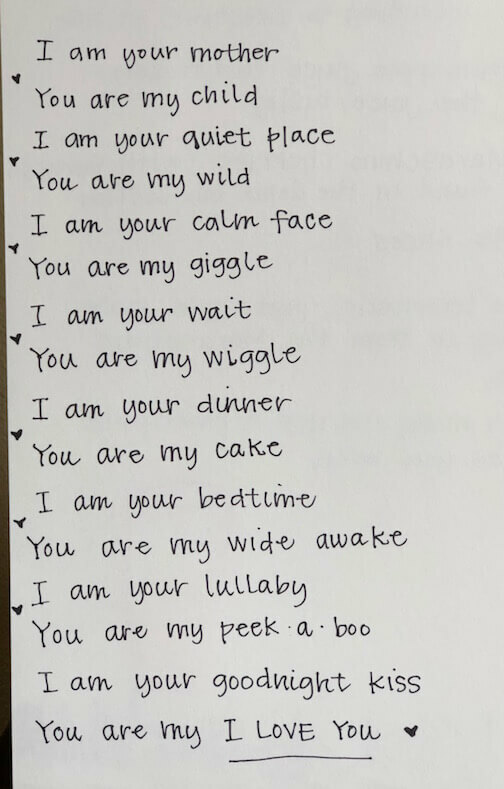 I use the PrintMaster program on my computer to print out the font/writing that I want. Then trace it onto waxed paper with a pencil. Flip the waxed paper over and trace the letters with piping gel. Then carefully lay the paper onto the cake, gel side down. Take a finger or small paint brush/q-tip and rub the waxed paper to transfer the design or writing onto the cake. Then I go over it with the icing that I want to write with. It just makes things come out too neat! I used the half ball pan (or you can use a Pyrex bowl) to make the baby's bottom. Cover the rump in icing and then white fondant. 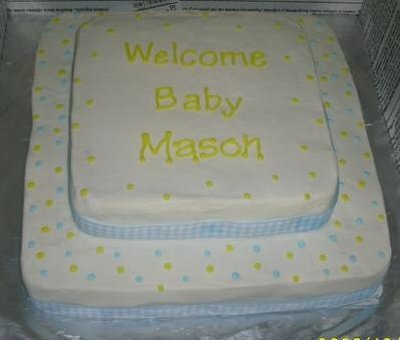 The baby bottom is on top of a 12 inch round cake (to feed more people). I used the cake scraps from the round cake to make the legs. I carved them to be rounded, then covered the legs in icing and then flesh colored fondant. I formed the feet out of rice krispy treats, covered them in thick fondant and made fondant toes. I then used a knife to make indentations in the feet as wrinkles. 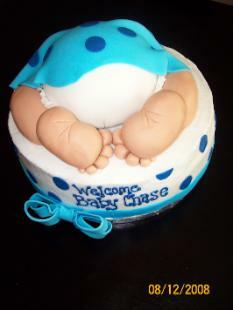 I rolled out some fondant and decorated it for the blanket, then just placed it on top of the rump. I frilled a small piece of white fondant and placed it along the top of the leg to look like diaper frill. It is normal when you are finished to find yourself talking to the little tyke. I couldn't help myself! I started out with white cake mix and added a teaspoon of vanilla and almond flavoring to spice it up. I iced it with a thin layer of buttercream icing and then topped it off with marshmallow fondant. I had never used fondant before to cover a cake, so this was a unique experience. I had tasted the boxed fondant before when we made soap bubbles for my granddaughters 2nd birthday cake and it tasted horrible. The marshmallow fondant was delicious. I will definitely use it again. Originally, I was going to make the edging and dots from the fondant also. However, I was in Target and had the revelation that I could use Whoppers to put around the edge of the cake instead of making the fondant balls. I attached the Whoppers with royal icing. Everyone at the shower loved this idea, because who doesn't love Whoppers. Then, the next day while getting a bow made for the top of the cake, I came across my perfect circles. I found candy melts in a variety of different colors. Perfect! Brown and light blue candy melts worked perfect and tasted great. I also attached them with royal icing. 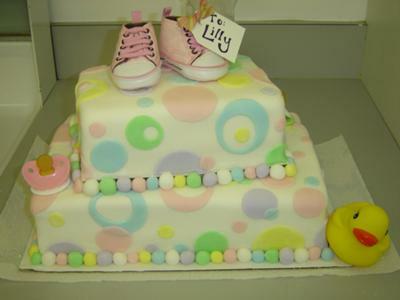 My original intent was to place a bow with baby shoes on the top of the cake. But when I was looking for my shower present, I came across this adorable doll. It says a prayer when you press its belly. 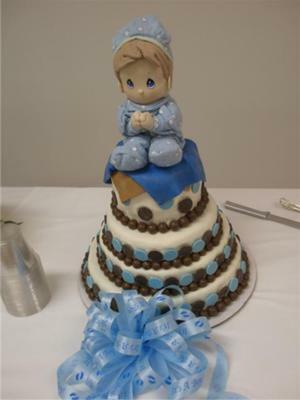 This turned out to be an adorable cake topper that the mom to be can take home as a memory of the shower for her perfect new son. This cake provides the guest with cake, icing, and candy all in one treat. I got rave reviews from the cake and fondant. I will definitely be using the marshmallow fondant again soon. I made this cake for my daughter who was expecting her first child. I wanted to attempt something out of the ordinary so I tried to duplicate a stacking toy I bought as a present for my yet unborn grandson. It is four double layers of carrot cake with cream cheese butter cream filling between the layers and all covered in fondant. The layer sizes are 4, 6, 8, and 10. The head with nose and eyes are covered Styrofoam. Other materials I tried including the krispy treats were too heavy. I had to make each layer separately covered in fondant and assemble the cake where the shower was taking place because it was too heavy to transport assembled. I had cardboard separations between each layer and small wooden dowels to support each layer. I made the loops on the top layer in time to allow them to set up so they would hold their shape and attached each loop with a small piece of raw spaghetti. This cake took close to 18 hours total to complete. It was truly a labor of love. My daughter appreciated my effort.